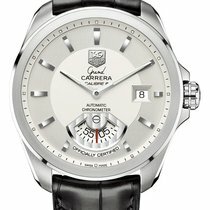 Pre-owned Tag Heuer Carrera Calibre 5 Automatic WV211M.BA0787 in exceptional condition. 39mm Polished and brushed stainless steel case. Black dial with silver-tone hands and index hour markers. Minute markers around the outer rim. Luminescent hands and markers. Date Window at the 3 o'clock position. Fixed Black aluminium bezel. Automatic Calibre 5 movement. Scratch resistant sapphire crystal. Exhibition case back. Case thickness: 12 mm. Stainless steel bracelet with a Deployment clasp. Water resistant at 100 meters. Box & Tag Heuer Papers dated March 2015. The pictures that you can see are pictures of the actual watch!! We sell only what we have IN STOCK!